"Another Great Week Enjoying The Paradise In The Northern Forest!" It was a great week here as well as a busy one. Four days of training two 4.5 mile runs and two 10 mile runs. 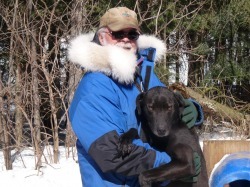 The dogs were being prepared for the race at Valcartier, Quebec for next weekend. However, due to poor snow conditions the race had to be postponed. This week, Laura Hermes arrived here from Germany for a three month stay to enjoy a Winter and dog mushing life at Miortuk. The dogs are all doing great and the runs this week were a real treat! We received another 4" of wet snow here today and we celebrated it with a nice bonfire served with Muled Wine and great snacks. It was a fun time with my friends Phil, Gary, Laura, Judith and Julian. Unfortunately, the forecast for tomorrow is for rain and then a freezing temperatures overnight into Monday. Let's hope the forecast is wrong and we get snow instead of the rain.